I was browsing the MLS a couple weeks ago when I stumbled across an AMAZING deal. It was a 4 bedroom, two bath house sitting on 8 acres with a long private drive, shed and like-new pole barn. I instantly recognized the house as one of my best friends from high school used to live there. As an added bonus it was also only half a mile from my Dad’s house. And it was listed at a whopping $20,000! I instantly wanted to buy it as an investment property. The problem was it was only open to owner occupant bids for the next two weeks. My brother has been looking for a deal close to my Dad’s house since my old trailer burned down. I decided to share my discovery and texted my Dad and brother about the deal and then promptly called the listing agent to get a showing. I figured since it was only open to owner occupants I’d rather my brother get it than anyone else and if he didn’t happen to like it I wanted to bid on it if that opportunity arose. I met my Dad and brother at the house on a Saturday morning. The place was booming. I had assumed that we were meeting with the agent but since there had been so much demand he had five other buyers looking at it all at the same time. The house was being sold “as is” as all HUD homes are. The house needed a very good cleaning and painting but overall still appeared to be an amazing deal. My brother decided to put in an offer. After speaking with the agent we discovered that when it comes to HUD homes the initial bidding process is sealed. All bids are taken and kept secret until a certain cut-off date. No bids are looked at beforehand. On the specified cut-off date HUD looks at all the bids and then chooses the best one. HUD homes are generally in need of some sort of repairs. Due to the age of home and the less than perfect condition there was no way an FHA loan would go through. This meant the financing options were cash or a conventional loan. With the financing all worked we had to figure out how much to offer. Figuring out a bid price is hard. By the looks of the people we saw viewing the property I had assumed at least half of them were actually investors and would be ineligible to bid at this time. But we really had no idea how much the property would go for. Next I checked Zillow. The estimate showed $87k. I thought that price seemed right on IF the property was in good condition. But it wasn’t. It was going to take $10-$20k to get the house back to what it should be. He decided to offer $26,127. One of the biggest struggles we’ve had throughout the process is that the listing agent (who was a friend of a friend no less) wouldn’t answer his phone. He called the day before to go over the process if my brother had gotten the house and promised to call us back the next day to let us know the results. We called and called. And texted. And nothing. After about a week he finally answered his phone and told us someone else bid significantly more. But for some reason he wouldn’t tell us how much more. So like any smart woman I went to the HUD website to check the bid results. And there it was………….$39,000. Mind blown. I definitely didn’t see it going that high. While my brother did not get the property I actually learned a ton from the process. There is no special financing for HUD homes. HUD homes are foreclosures bought back by the HUD agency and are available at a steep discount to owner occupants for the first few weeks and then investors after that deadline passes. HUD homes typically don’t qualify for FHA loans. Since HUD homes are generally in need of many repairs they typically won’t qualify for FHA loans. In most cases you’ll need either a conventional loan or cash. Bid as high as you can without regretting it. It’s so hard to tell what the house will go for. I would have never dreamed that in my area someone would’ve bid twice as much as what the house was listed for. Bid as high as you can without regretting it. Get an inspection before bidding. If you want a home inspection you need to have it done before you put in your offer. You can check listings in your area and bid results on the HUD website. Visit the HUD website here to get all the details for your area. A buyer’s agent might be a good idea. It’s pretty annoying when an agent won’t call you back just to say “you didn’t get it” when they promise to do so. You might have better luck having a buyer’s agent act on your behalf. All is not lost. I learned a lot and if I (or my brother) ever bids on a HUD home again I’ll know how it all works. 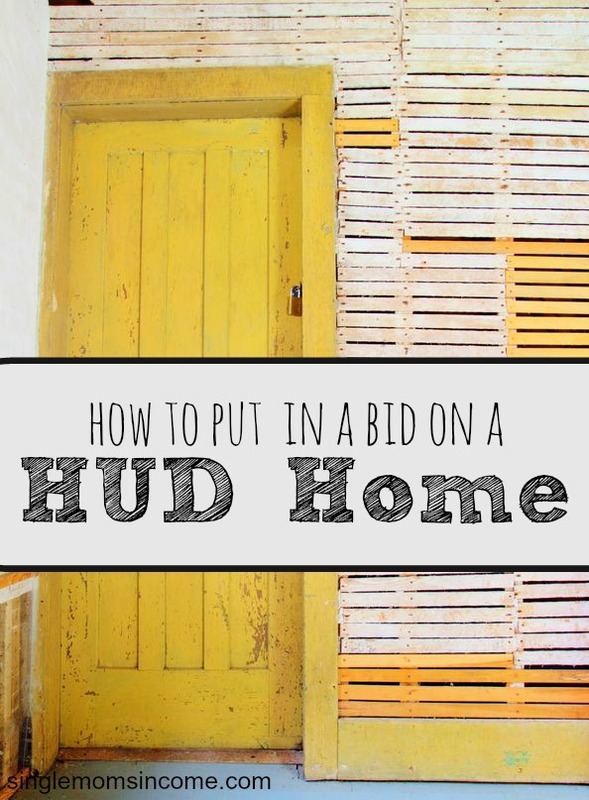 Have you ever bid on a HUD home? I honestly think that since was the first time that you were part of the process, that you have to consider it a success just in how much you learned. There will be other houses, and now that you have been part of the experience, it will help you and your family with potential future opportunities. Oh yeah, that would be tough to have to move halfway through the process. I, too, love the idea of putting in sweat equity in a home. The problem is I rarely see houses that I think I can make work and unfortunately when I do they go too fast! If you were to stay in a place for more than year you can buy a HUD home as an owner occupant if you live there at least a year. That way you could do work when you lived there and hopefully sell for a profit thereafter. We bought a foreclosed home that was called Fannie Mae HomePath, meaning that it was a bank-owned home in livable condition. We actually got new carpeting throughout (although it was rather cheap quality) brand new and good-quality oven/range, microwave and dishwasher, new kitchen cabinets and laminate countertops, new laminate flooring in kitchen and bathroom, new tub and laminate tub walls in bathroom, plus new paint throughout. We did have to buy a new fridge, and due to new kitchen configuration, had to upgrade electrical (old house previously with partial knob & tube wiring). Thanks for the tip! I just checked out the FannieMae HomePath and there were two properties in my area listed. One of them appears to be in excellent condition but is a little out of the price range we’re looking. I’m going to keep an eye on that site too to see what comes up over the next few months. 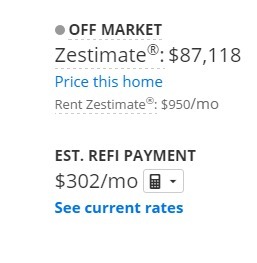 Home prices in your area are so amazing. People spend that much on cars! I’m in a competitive real estate market where HUD prices get about a 20% discount. If you keep looking, you’ll find something though. Thank you SO much for writing this piece. I’ve been trying to figure out how to buy HUD homes for the longest time! I mean the website helps, but someone’s real life experience is great to have.